Our product range includes a wide range of polypropylene wheel arch cover. 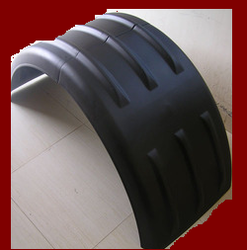 Polypropylene Wheel Arch Cover offered can be availed in a wide range of finish choices and are made using quality plastic that also provides in these covers durable finish support. Matching up with the aesthetics of cars, these can be made available by us in different finish sizes to choose from. Providing for longer working life, these also help in enhancing the look and feel of the vehicles. We can also customize these as demanded by the customers.